Toyota has unveiled the Mirai, ‘future’ In Japanese, a fuel cell vehicle which will reach dealerships in April next year. Akio Toyoda mentioned “The future has arrived” while elaborating on the entire concept. Buying this green car entitles you to get nearly 3 million yen in subsidies from the government. While the primary fuel has been petrol for the past century, Hydrogen is the future and this is a step towards that. The Mirai is a four door sedan with typical Japanese futuristic body style. 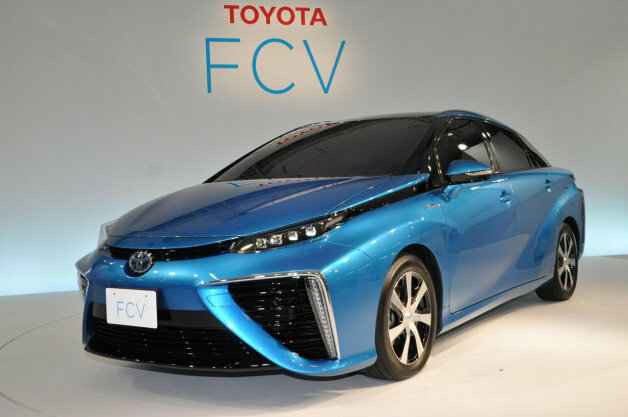 You will find many similarities in the Mirai and the FCV concept which Toyota showcased in Tokyo last year. The company hopes to sell 700 Mirai cars next year. It also envisions sales numbers in tens of thousands around the year 2020. The cars will roll out of the Toyota plant in Motomachi near Toyota City. Toyota has not revealed the pricing but the expected range is between 6.5 to 7.5 million yen. The major hurdle for Fuel Cell Vehicles (FCVs) has been the safety factor when working with hydrogen. With R&D and new technologies, car makers seem to have taken huge strides to make hydrogen safe for the road. FCVs also face a lot of flak from EV manufacturers who for some reason think EVs are a better option for a sustainable environment than hydrogen powered cars. This race is a very closed contested one and only time will tell which one of the two ups the other. For us, whichever can match the fun element of the petrol powered car is the clear winner. This guy drinks water from the exhaust of Toyota Mirai !! !